For other uses, see Monorail (disambiguation). Not to be confused with Single-track railway. A monorail is a railway in which the track consists of a single rail or a beam. The term is also used to describe the beam of the system, or the trains traveling on such a beam or track. The term originates from joining "mono" (one) and "rail" (rail), from 1897, possibly from German engineer Eugen Langen, who called an elevated railway system with wagons suspended the Eugen Langen One-railed Suspension Tramway (Einschieniges Hängebahnsystem Eugen Langen). Colloquially, the term "monorail" is often used to describe any form of elevated rail or people mover. More accurately, the term refers to the style of track,[note 1] not its elevation, with 'Mono' meaning 'one', and 'Rail' meaning 'rail'. Monorails are often elevated, sometimes leading to confusion with other elevated systems such as the Docklands Light Railway, Vancouver SkyTrain and the AirTrain JFK, which run on two rails. Monorail vehicles often appear similar to light rail vehicles, and can be manned or unmanned. They can be individual rigid vehicles, articulated single units, or multiple units coupled into trains. Like other advanced rapid transit systems, monorails can be driven by linear induction motors; like conventional railways, vehicle bodies can be connected to the beam via bogies, allowing curves to be negotiated. Unlike some trams and light rail systems, modern monorails are always separated from other traffic and pedestrians. They are both guided and supported via interaction with the same single beam, in contrast to other guided systems like rubber-tyred metros, the Sapporo Municipal Subway; or guided buses or trams, such as Translohr. Monorails do not use pantographs. Under the Monorail Society's beam-width criterion, some, but not all, maglev systems are considered monorails, such as the Transrapid and Linimo. Maglevs differ from other monorails in that they do not (normally) physically contact the beam. The first monorail prototype was made in Russia in 1820 by Ivan Elmanov. Attempts at creating monorail alternatives to conventional railways have been made since the early part of the 19th century. The Centennial Monorail was featured at the Centennial Exposition in Philadelphia in 1876. The Boynton Bicycle Railroad was a steam-powered monorail in Brooklyn on Long Island, New York. It ran on a single load-bearing rail at ground level, but with a wooden overhead stabilising rail engaged by a pair of horizontally opposed wheels. The railway operated for only two years beginning in 1890. The Hotchkiss Bicycle Railroad was a monorail on which a matching pedal bicycle could be ridden. The first example was built between Smithville and Mount Holly, New Jersey, in 1892. It closed in 1897. Other examples were built in Norfolk from 1895 to 1909, Great Yarmouth, and Blackpool, UK from 1896. Early designs used a double-flanged single metal rail alternative to the double rail of conventional railways, both guiding and supporting the monorail car. 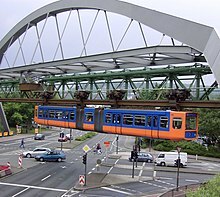 A surviving suspended version is the oldest still in service system: the Wuppertal monorail in Germany. Also in the early 1900s, Gyro monorails with cars gyroscopically balanced on top of a single rail were tested, but never developed beyond the prototype stage. The Ewing System, used in the Patiala State Monorail Trainways in Punjab, India, relies on a hybrid model with a load-bearing single rail and an external wheel for balance. One of the first systems put into practical use was that of French engineer Charles Lartigue, who built a line between Ballybunion and Listowel in Ireland, opened in 1888 and closed in 1924 (due to damage from Ireland's Civil War). It uses a load-bearing single rail and two lower, external rails for balance, the three carried on triangular supports. Possibly the first monorail locomotive was a 0-3-0 steam locomotive. A highspeed monorail using the Lartigue system was proposed in 1901 between Liverpool and Manchester. In 1910, the Brennan gyroscopic monorail was considered for use to a coal mine in Alaska. In June 1920, the French Patent Office published FR 503782, by Henri Coanda, on a 'Transporteur Aérien' -Air Carrier. In the northern Mojave desert, the Epsom Salts Monorail was built in 1924. It ran for 28 miles from a connection on the Trona Railway, eastward to harvest epsomite deposits in the Owlshead Mountains. This non-passenger, Lartigue type monorail achieved gradients of up to ten percent. It only operated until June 1926, when the mineral deposits become uneconomic, and was dismantled for scrap in the late 1930s. The first half of the 20th century saw many further proposed designs that either never left the drawing board or remained short-lived prototypes. One of the first monorails planned in the United States was in New York City in the early 1930s, scrubbed for an elevated train system. In the latter half of the 20th century, monorails had settled on using larger beam- or girder-based track, with vehicles supported by one set of wheels and guided by another. In the 1950s, a 40% scale prototype of a system designed for speed of 200 mph (320 km/h) on straight stretches and 90 mph (140 km/h) on curves was built in Germany. There were designs with vehicles supported, suspended or cantilevered from the beams. In the 1950s the ALWEG straddle design emerged, followed by an updated suspended type, the SAFEGE system. Versions of ALWEG's technology are used by the two largest monorail manufacturers, Hitachi Monorail and Bombardier. In 1956, the first monorail to operate in the US began test operations in Houston, Texas. Disneyland in Anaheim, California, opened the United States' first daily operating monorail system in 1959. Later during this period, additional monorails were installed at Walt Disney World in Florida, Seattle, and Japan. Monorails were promoted as futuristic technology with exhibition installations and amusement park purchases, as seen by the legacy systems in use today. However, monorails gained little foothold compared to conventional transport systems. In March 1972, Alejandro Goicoechea-Omar had patent DE1755198 published, on a 'Vertebrate Train', build as experimental track in Las Palmas de Gran Canaria, Spain. Niche private enterprise uses for monorails emerged, with the emergence of air travel and shopping malls, with shuttle-type systems being built. From 1950 to 1980, the monorail concept may have suffered, as with all public transport systems, from competition with the automobile. Monorails in particular may have suffered from the reluctance of public transit authorities to invest in the perceived high cost of un-proven technology when faced with cheaper mature alternatives. There were also many competing monorail technologies, splitting their case further. One notable example of a public monorail is the AMF Monorail that was used as transportation around the 1964-1965 World's Fair. This high-cost perception was challenged most notably in 1963 when the ALWEG consortium proposed to finance the construction of a major system in Los Angeles in return for the right of operation. This was turned down by the city authorities in favour of no system at all, and the later subway system has faced criticism[by whom?] as it has yet to reach the scale of the proposed monorail. Several monorails[example needed] initially conceived as transport systems survive on revenues generated from tourism, benefiting from the unique views offered from the largely elevated installations. From the 1980s, most monorail mass transit systems are in Japan, with a few exceptions. Tokyo Monorail, today one of the world's busiest, averages 127,000 passengers per day and has served over 1.5 billion passengers since 1964. Monorails have seen continuing use in niche shuttle markets and amusement parks. Modern mass transit monorail systems use developments of the ALWEG beam and tire approach, with only two suspended types in large use. Monorail configurations have also been adopted by maglev trains. Since the 2000s, with the rise of traffic congestion and urbanization, there has been a resurgence of interest in the technology. Many cities today are seeing monorails as a possible mass transit solution. Chongqing Rail Transit in China has adopted a unique ALWEG-based design with rolling stock that is much wider than most monorails, with capacity comparable to heavy rail. This is because Chongqing is criss-crossed by numerous hills, mountains and rivers, therefore tunneling is not feasible except in some cases (for example, lines 1 and 6) due to the extreme depth involved. Today it is the largest and busiest monorail system in the world. São Paulo, Brazil is building a Bombardier Innovia Monorail system as part of its public transportation network. The 14.9 mile guideway will have 17 stations, 54 monorail trains and a passenger capacity of 40,000 commuters per hour in each direction. Another city installing a Bombardier Innovia Monorail system in an urban centre is Riyadh, Saudi Arabia, for its new King Abdullah Financial District. India has proposed monorails in several cities for mass rapid transit; Mumbai Monorail is the first one in operation. In December 2014, the government of Malta proposed a monorail system to the European Commission as an infrastructure project to benefit from EU funding. The network would be 76 km (47 mi). However, as of 2016, the project is still in the proposal stages with no funding source secured. China, already home to the world's largest and busiest monorail system has a number of mass transit monorails under construction in several of cities. A Bombardier Innovia Monorail-based system is under construction in Wuhu and several "Cloudrail" systems developed by BYD under construction a number of cities such as Bengbu, Anyang and Shantou. Modern monorails depend on a large solid beam as the vehicles' running surface. There are a number of competing designs divided into two broad classes, straddle-beam and suspended monorails. The most common type is the straddle-beam, in which the train straddles a steel or reinforced concrete beam 2 to 3 feet (0.6 to 0.9 m) wide. A rubber-tired carriage contacts the beam on the top and both sides for traction and to stabilize the vehicle. The style was popularized by the German company ALWEG. The French company SAFEGE offers a system with cars suspended beneath the wheel carriage, and the wheels ride inside the single beam. The Chiba Urban Monorail is the world's largest suspended network. There is also a historical type of suspension monorail developed by German inventors Nicolaus Otto and Eugen Langen in the 1880s. It was built in the twin cities of Barmen and Elberfeld in Wuppertal, Germany, opened in 1901, and is still in operation. Magnetic levitation train (maglev) systems by the German Transrapid were built as straddle-type monorails, as they are highly stable and allow rapid deceleration from great speed. At speed, maglev trains hover over the track and are not in physical contact with it. The maglev is the fastest train of any type, the experimental SCMaglev having recorded a speed of 603 km/h (375 mph). The commercial Shanghai Maglev Train has run at 501 km/h (311 mph). However, the guideway is so wide that it can be argued it is not legitimate to call it a monorail. There are also slower maglev monorails intended for urban transport, such as Japan's Linimo (2003). Some early monorails (notably the suspended monorail at Wuppertal, Germany, which dates from 1901 and is still in operation) have a design that makes it difficult to switch from one line to another. Some other monorails avoid switching as much as possible by operating in a continuous loop or between two fixed stations, as in the Seattle Center Monorail. Current monorails are capable of more efficient switching than in the past. With suspended monorails, switching may be accomplished by moving flanges inside the beamway to shift trains to one line or another. The Sydney Monorail in Sydney avoided switching by operating in a single loop. Straddle-beam monorails require that the beam moves for switching, which was an almost prohibitively ponderous procedure. Now the most common way of achieving this is to place a moving apparatus on top of a sturdy platform capable of bearing the weight of vehicles, beams and its own mechanism. Multiple-segmented beams move into place on rollers to smoothly align one beam with another to send the train in its desired direction, with the design originally developed by ALWEG capable of completing a switch in 12 seconds. Some of these beam turnouts are quite elaborate, capable of switching between several beams or simulating a railroad double-crossover. An alternative to using a wye or other form of switch, is to use a turntable, where a car sits upon a section of track that can be reoriented to several different tracks. For example, this can be used to switch a car from being in a storage location, to being on the main line. The now-closed Sydney Monorail had a traverser at the depot, which allowed a train on the main line to be exchanged with another from the depot. There were about six lines in the depot, including one for maintenance. Rubber-tired monorails are typically designed to cope with a 6% grade. Rubber-tired light rail or metro lines can cope with similar or greater grades - for example, the Lausanne Metro has grades of up to 12% and the Montreal Metro up to 6.5%, while VAL systems can handle 7% grades. Marge vs. the Monorail, an episode of the American animated sitcom The Simpsons satirizing the mode of transportation and widely praised by fans & critics as one of the best episodes of the entire series. ^ The term "track" is used here for simplicity. Technically the monorail sits on or is suspended from a guideway containing a singular structure. There is an additional generally accepted rule that the support for the car be narrower than the car. "Monorail Society, What is a monorail?". Monorails.org. Retrieved 2010-09-11. ^ "Etymology Online entry for monorail". Etymonline.com. Retrieved 2010-09-11. ^ "Dictionary.com definitions of monorail". Dictionary.reference.com. Retrieved 2010-09-11. ^ "Quite often, some of our friends in the press and public make the assumption that any elevated rail or peoplemover is a monorail". Monorails.org. Retrieved 2010-09-11. ^ "NLA Australian Newspapers - article display". Newspapers.nla.gov.au. Retrieved 2010-09-11. ^ "Monorail Society, What is a monorail?". Monorails.org. Retrieved 2010-09-11. ^ Finchley Society (1997-06-26). "Finchley Society Annual General Meeting Minutes" (PDF). Archived from the original (PDF) on 2008-12-04. Retrieved 2009-04-03. ^ Today in Science History. "June 25 - Today in Science History". Retrieved 2009-04-03. ^ Anthony J. Bianculli (2008). Iron rails in the Garden State: tales of New Jersey railroading. Indiana University Press. ^ "100 years of fun and thrills". Eastern Daily Press. September 10, 2009. Retrieved 2012-01-20. ^ "Hotchkiss Bicycle Railway, Great Yarmouth C. 1900". FotoLibra. Retrieved 2012-01-19. ^ "NLA Australian Newspapers - article display". Newspapers.nla.gov.au. 1910-09-05. Retrieved 2010-09-11. ^ "America's First Monorail Line Planned For New York." Popular Mechanics, November 1930, p. 71. ^ "German's Develop Fast Monorail System For High Speed Travel" Popular Mechanics, January 1953, p. 127. ^ "First U.S. Monorail Has Trial Run." Popular Mechanics, June 1956, p. 77. ^ "Disneyland Adds Submarine and Monorail". Popular Mechanics. July 1959. Retrieved 21 December 2010. ^ "1.5 billionth rides monorail to Haneda". Japan Times. 2007-01-24. Retrieved 2007-01-24. ^ a b Trevisani, Paulo (23 May 2011). "Has the Monorail's Future Finally Arrived?". The Wall Street Journal. The Wall Street Journal. Retrieved May 23, 2011. ^ "Riyadh monorail contract awarded". Railway Gazette. Railway Gazette. 1 June 2010. Retrieved 1 Jun 2010. ^ "India's first Monorail Service inaugurated in Mumbai". Biharprabha News. Retrieved 1 February 2014. ^ "Monorail system among Malta government proposals for EU funding". ^ "Monorail on backburner as Malta remains without EIB financing". maltatoday.com.mt. ^ "Metrail Test Track Photo Essay - page one of three". Monorails.org. 2002-10-18. Retrieved 2010-09-11. ^ Svensson, Einar. "Definition and Description of Monorail" (PDF). Retrieved 16 August 2012. ^ society, monorail. "definition of monorail". monorail society. Retrieved 16 August 2012. ^ "The Switch Myth". Retrieved 2007-01-15. ^ "The Railroad Turntable". American-Rails.com. Retrieved 2018-02-03. ^ "Railway turntable | Work With Sounds". www.workwithsounds.eu. Retrieved 2018-02-03. ^ "Steeper Grade, Smaller Curve Radius". Hitachi Rail. Archived from the original on 2011-07-19. Retrieved 2010-09-11. ^ "Is there people-mover in your future?". Railway Age. 1998. Archived from the original on 2012-07-08. ^ "重庆轨道3号线成世界上最繁忙的单轨线". 国际在线. Archived from the original on 2014-12-05. Retrieved 2014-11-30. ^ 网易. "重庆单轨里程世界第一 列车国产化率95%_网易新闻". news.163.com. Wikimedia Commons has media related to Monorail.